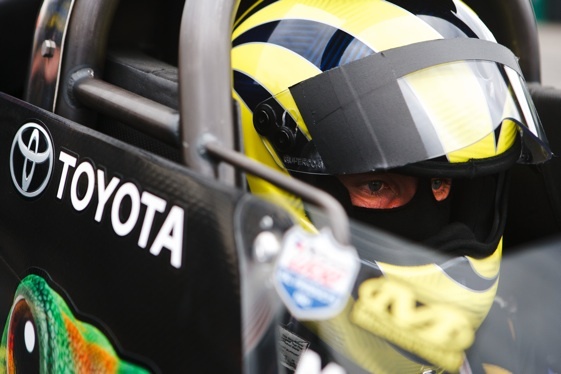 The fun parts have always been there for Top Fuel driver Morgan Lucas. The speed, the competition, the atmosphere. However, there have also been the not-so-much-fun parts. The parts which came with unpredictable performance. The 2012 NHRA season is only two events into its 23-race schedule, but it appears that Lucas and his Lucas Oil Racing Geico/Toyota team have taken major steps toward shaving away some of those not-fun parts. Like those that had made late Sunday afternoons so painful. The car went on display in the season-opening O’Reilly Auto Parts Winternationals at Pomona last month. 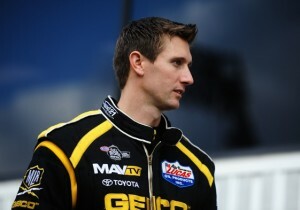 Lucas was fastest in the Top Fuel class in all of the qualifying sessions and headed into the final eliminations in P1. victory and a personal-best ET when his car’s rear end failed. A couple of personal-best 3.7-second runs during the weekend eased a bit of the hurt as Lucas and his team left California knowing they were a group capable of competing with the likes of Don Schumacher Racing and Al-Anabi Racing. At Phoenix in Week 2, Lucas’ team suffered a second-round loss to Langdon but did enough good things to head to Gainesville, Fla. this week for the Gatornationals still feeling good-to-great about where his team is vis a vis the teams which have dominated Top Fuel in recent years. Lucas’ history in NHRA has been pretty darn good. During his Top Alcohol days, he won 11 events. In 2003, he was division champ and finished second in points nationally. Lucas moved to Top Fuel for eight races in 2004 and made two-semifinal appearances. He went full-time in 2005. Since then, the has won four events and has been a Countdown-qualifier the past three seasons. This year, with some changes to team and personnel, Lucas’ team is confident and competitive. Among items changed is the crew chief position. Last year, Lucas served as his own tuner the last six races. In the off-season, the team turned to the veteran duo of Aaron Brooks and Rod Centorbi. Great move, Lucas said. “We’ve got a really awesome crew but we needed more leadership at the crew chief position. Sometimes we were close but we needed those last few key pieces. Every recipe has a key ingredient and now we have that,” Lucas said. Lucas also has a new teammate this season. Veteran Brandon Bernstein has come over and for the first time, will be racing for someone other than his father, the legendary Kenny Bernstein. But once on the strip, the potential of the revamped team became evident. This Geico/Toyota team will arrive at this weekend’s Gatornationals with a plan in place. The same plan that will be in place all year long. “Build on consistency,” Lucas said. In the NHRA, plans do go wrong. They could in Gainesville.